The Black Swan seminar room is ideal for your theoretical and/or practical training. The room can be arranged in both seminar and conference style. There are two plasma screens that allow you to see the procedure taking place and a large screen to project your documents. > Equipped with live broadcast material in the training room. *In case of multiple procedures, there is a possibility of reserving a 2nd and/or a 3rd block. 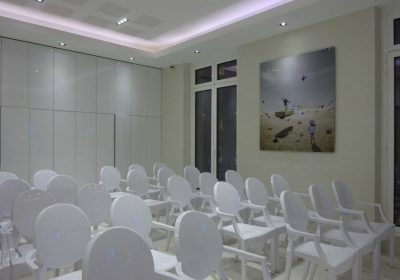 Clinique des Champs Élysées provides a prestigious location at the forefront of medicine and cosmetic surgery for you to successful organize your workshops and trainings events. There are three consecutive rooms available to carry out your medical procedures at your own comfort. The surgical unit is equipped with a high-definition camera that broadcasts the procedure live into the training rooms. With this feature, the doctor is able to keep a direct communication with those participating and observing in the workshop. Our highly qualified staff are available to help with any needs you have for your seminar/workshop. Medical or nurse assistants can assists doctors during their procedures on the block. Our on-site pharmacy can prepare all the medical equipment and products necessary for the workshops.